For 30 years, Venom has been terrorizing the Marvel Universe. 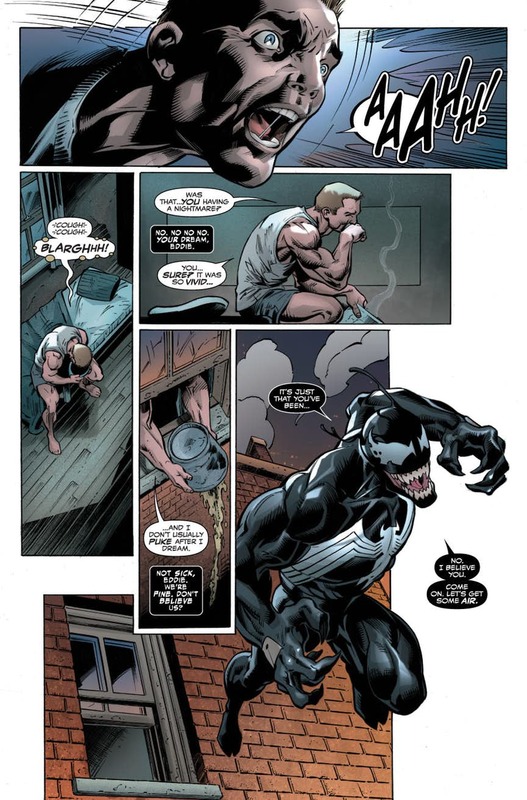 As of late Eddie Brock and the Venom symbiote have attempted to turnover a new way of life and a path towards redemption. This month marks the return of Mark Bagley to penciling duties as the book opens with a shocking return of another symbiote character and his posse. Shocking happens to be the running theme in this issue since Eddie also attempts to take on a villain with sonic abilities. He’s old Spider-Man villain that Mike Costa has brought back from Spider-Man’s rogue gallery. The situation creates some nice conflict between Eddie and his bonded friend. The story takes a nice twist when an old friend of Eddie’s past returns. The plot should create some nice conflicts with his morality. The ending of the issue leaves us excited to continue on this journey and see where it leads next issue.